This beautiful wedding gown was worn by Patricia Lee DeJoy on Sunday June 3rd, 1956, when she married her true love Ensign Armand Tise Eyler Jr., USN., The gown was purchased at Garfinckels in Washington, D.C., from the Saks 5th Avenue collection. The ceremony was held at Christ Episcopal Church, Elizabeth City, North Carolina. Tise’s father, The Rev. Armand Tise Eyler, a priest of the Episcopal Church, performed the double ring ceremony. Tise graduated from the United States Naval Academy three days earlier and received his commission. His roommates and close friends from the Academy were ushers and provided the traditional sword archway. The gown was worn six years later by Pat’s sister. The wedding gown was recently returned to Pat (50 years later in 2012) and has been restored to its original grace and beauty by Heritage Garment Preservation. 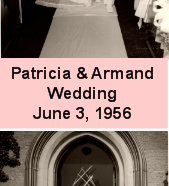 Tise and Pat celebrated 56 years of marriage on June 3rd, 2012.